After two long days on the road without my navigator, he was ready to travel east with me to touch base with another former classmate from Guelph who came west with me to spend summer on our farm. Many years ago she bought a small farm near Holstein with its original old stone house. On the hundredth anniversary of the house she planted 100 varieties of trees: fruit, berries, conifers, etc. They grew to maturity and now alas, most have vanished. Her rock garden still flourishes. More miles eastward to a couple who five years ago provided an island of peace on the occasion of my Mother’s death in her 105th year. 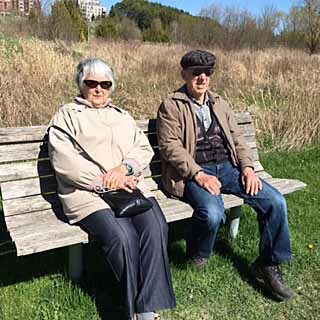 My husband and I had flown to attend his mother’s 100th birthday in Seaforth, Ontario, but I found it difficult to move so quickly from loss to celebration. We had three days before the party and arranged a couple of days at a quiet retreat. Now we returned to enjoy their hospitality, woods, and converstion. Barbara had a just published a short story about her father in an anthology: Engraved, Canadian Wat Stories of World War One, edited by Bernadette Rule. You can purchase it on line. Innisfil: Next morning we headed further east to meet Wendy, with another For Elise connection. 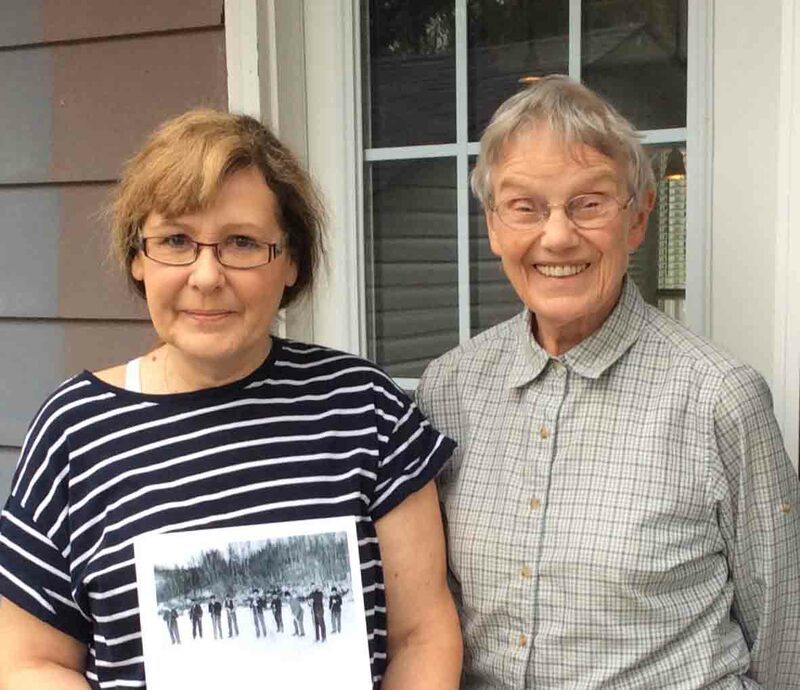 While travelling to BC last summer for her daughter’s wedding she bought the book in Brandon. To her great surprise and joy she discovered her ancestors, Charles and Clara Bellhouse, postmasters at Aweme in 1880s and 90s. Her great grandmother had been the baby girl whose father was killed in a train accident and her mother, Marion, returned to her parents’ home at Aweme. The little girl grew up, trained as a nurse following in her grandmother Clara’s steps, who with the exception of the Criddle children, was the midwife for all the babies round about including my father. The Bellhouse family continued the post office tradition and Wendy now works for Canada Post. 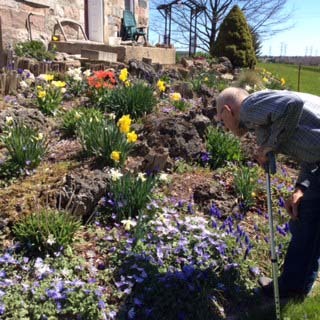 Aurora: Another restorative visit with Dalton & Carol Beaver, a friend from my Toronto studies. 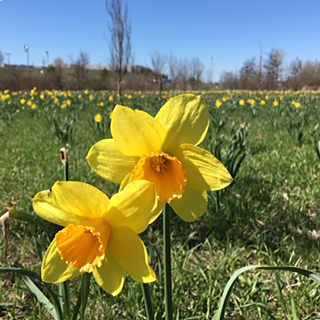 On a coolish afternoon we walked through a field of daffodils in the Aurora Community Arboretum, 100 acres of parkland dedicated to maintenance of trees and shrubs. Families are encouraged to plant trees in memory of their loved ones. Two years ago Carol lost a daughter to suicide and had a memorial bench placed there in the natural setting her daughter loved. Nearing a pond, we heard a noisy chorus—actually a regular din—from what we thought were large frogs. But, no they were toads, singing their throats out for love. We observed them busily ensuring that their species would survive. They cared not that we watched fascinated from the pond’s edge. Finally, we settled on the memory bench, remembering our dear one lost, and pondered the meaning of life, ours and hers.